We are a full service moving company and as such we make sure to provide our clients with a range of services that are fit to all their moving needs. That is why a couple of years back we have tailored a special man with van hire in London service for those of our clients that do not need a full moving service, but still require some degree of professional assistance with the relocation job they are currently handling. Naturally, a man and van from our company would also be of help with a variety of other moving jobs. If you are wondering if this is the right choice for you, just contact our helpful customer support and an outgoing and very well trained expert from our team will discuss your project with you and we will figure out what the next step is together. 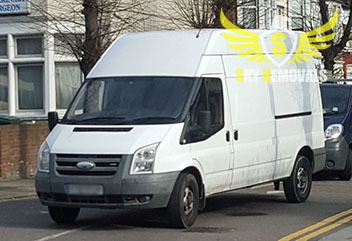 What you need to know is that our man with van hire in London service is delivered with the help of state of the art vans that are a suitable size for most jobs that you might have to get carried out. All our vans are navigated via GPS so that you can keep track of your goods on the road. All of Sky Removal London‘s vehicles are thoroughly cleaned after a move, so that they are in prime condition for the next client. Comprehensive packing services, or delivery of packing supplies can be added to and actually enhance your man with van hire in London experience. 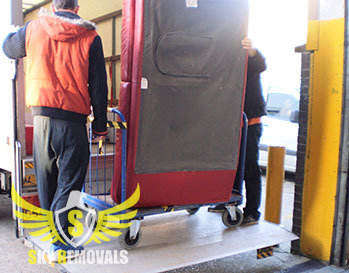 As with any removal in London, domestic or commercial, packing is an essential part of the process and you should not make compromises of any sort with it. Leave it to our great packers and movers to do the job for you. Hiring a van from us would be an inexpensive way to tackle a commercial or a domestic relocation in London. Due to their comparatively smaller size, our vans are very economical. They do not need expensive parking permits like most big removal trucks do and they can maneuver easier through the crowded streets of London, thus ensuring a quicker completion of your relocation job. All of those bring down significantly the price of the service, thus reflecting pretty well on your budget as well. London as you very well know is the capital of the United Kingdom. According to the recent estimated, some 8.5 million people live here. They come from literally every corner of the globe. London is perhaps the most diverse place in the world. The city was founded by the Romans circa 47 AD, on the north bank of the River Thames. This is probably the reason why even today North London is considered to be the better part of the capital, while the territory to the south of the river are more of a suburban and sometimes even rather isolated character. The fact that most of the stops of the Tube are in north is also a contributing factor.